Here is the road I normally take to work. This morning, I had to reconsider which roads to take. Luckily, I chose to drive I-45 to the Loop 610 to I-59 and then through the streets South of Downtown. The view above shows SH-288 (usually the last 10 miles of my morning commute). The above photo comes from the southwestern bank of 288 at about Mainer. 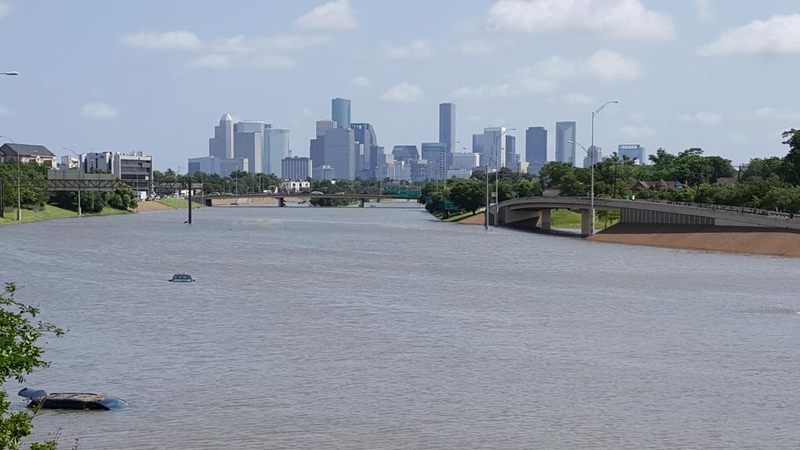 Taken from the southbound 288 feeder, this photo is a little deceptive since you cannot see that road emerges from the water at about this point. However, you this photo does allow you to see much of the distance covered by water. Furthermore, it lets you see the Holly Hall overpass and the Yellowstone overpass beyond that. Sadly, I’m too vain to have kept the blurry pictures of 18-wheelers plowing through water on the feeders of I-45 at about Shepherd. Likewise, I did not keep the videos of the drive along 288.